1. Mix together the orange zest and juice, soy sauce and sesame oil 2. Blanch the broccoli in boiling water for 2 minutes, then drain 3. Finely shred the ginger. Then heat a large frying pan or wok, add the sunflower oil, heat it until sizzling, and fry the ginger till it's crisp. 4. When cooled, remove. Add the beef and garlic, and stir-fry until just browned. Remove the meat using a slotted spoon and set aside. 5. 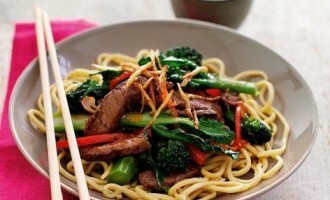 Add the red pepper and broccoli and stir-fry for a few minutes until it's tender. Add the soy sauce mixture, bring it to the boil then return the beef to the pan and heat through. Serve with noodles.